The Samajwadi Party leader took a dig at the Congress by saying that while SP and BSP were “fighting the election to stop the BJP, others were looking to use the election to build their party”. New Delhi: The Samajwadi Party president and former chief minister of Uttar Pradesh Akhilesh Yadav tacitly took a dig at the Congress for deciding to contest the upcoming general elections alone. 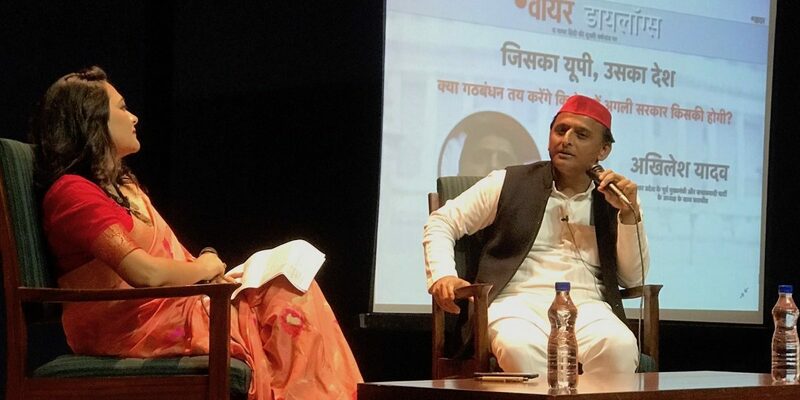 The former chief minister was in conversation with The Wire’s senior editor Arfa Khanum Sherwani at The Wire Dialogues, a public event organised here to mark the second anniversary of The Wire Hindi’s launch. The three parties have forged an alliance for the general elections. While the SP and BSP will contest 37 seats each out of the 80 seats in Uttar Pradesh, RLD may contest three to four seats. The alliance has decided not to put up their candidates in Amethi and Rae Bareli constituencies, held by Rahul Gandhi and Sonia Gandhi respectively, effectively leaving them for the Congress. However, the Congress – by appointing Priyanka Gandhi and Jyotiraditya Scindia as the general secretaries in-charge of the state – has indicated that the party will contest the polls in its full strength. It was thought that the entire opposition would unite to take on the BJP, which won a whopping 71 seats in 2014. However, the Congress’s decision has now created the possibility of a triangular contest that may eventually end up helping the BJP. To a question why the two state-level parties did not bring the Congress on board, Yadav cleverly argued that the grand-old party was part of coalition as they were supporting the Congress candidates in two seats. “When Mamata Banerjee called a united opposition rally, all of us were together. The fact is that all the opposition parties are taking on the BJP in their respective states. In Bengal, it is Mamata Banerjee. In other states too, the main players have come together to contest the BJP,” he said, asserting the weight of SP and BSP over the Congress in UP. He welcomed Priyanka Gandhi into politics. “Only when new people join, will politics change in the country,” he said. In a way, he avoided direct answers on the Congress but asserted that the opposition is united as far as resisting the BJP’s “autocratic” regime is concerned. “Vichaardhara ki ladaai hai is baar (It’s a battle of ideologies this time),” he said. On whether he would accept Rahul Gandhi as the prime minister in a post-poll scenario, he said, “Waise toh main samajwadi hoon, magar sarkaar banane mein bhagayawadi hoon (Although I am a socialist, I believe in fortune when it comes to who will form the government),” he said, tongue firmly in cheek. He said that he would like to have someone from UP to become the prime minister. “Yeh garv ki baat hogi agar koi UP se hi prime minister bane. (It would be a matter of pride if the next prime minister is from UP).” Although he was taking a shot at Narendra Modi, who belongs to Gujarat, he also indicated that he could accept both Mayawati and Rahul Gandhi – both of whom are from UP – as the prime minister. However, he categorically said that he was not in the prime ministerial race. “Who would have thought a few years ago that there can be someone other than Modi for the prime minister… But you must ask [Nitin] Gadkariji, why is he making a new expressway that leads to Delhi,” Yadav said.